Napoleon reviewing the Imperial Guard, by Horace Vernet, 1836. 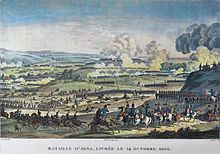 The twin battles of Jena and Auerstedt (older name: Auerstädt) were fought on 14 October 1806 on the plateau west of the river Saale in today's Germany, between the forces of Napoleon I of France and Frederick William III of Prussia. The decisive defeat suffered by the Prussian Army subjugated the Kingdom of Prussia to the French Empire until the Sixth Coalition was formed in 1812. Several figures integral to the reformation of the Prussian Army participated at Jena–Auerstedt, including Gebhard von Blücher, Carl von Clausewitz, August Neidhardt von Gneisenau, Gerhard von Scharnhorst, and Hermann von Boyen. 15,000 under Ernst von Rüchel. Further north, in the vicinity of Auerstedt, the French forces were Jean-Baptiste Bernadotte's I Corps (20,000 strong) and Louis Nicolas Davout's III Corps (27,000). The battles began when elements of Napoleon's main force encountered Hohenlohe's troops near Jena. Initially only 48,000 strong, the Emperor took advantage of his carefully planned and flexible dispositions to rapidly build up a superior force of 96,000 men. The Prussians were slow to grasp the situation, and slower still to react. Before Ruchel's 15,000 men could arrive from Weimar, Hohenlohe's force of 38,000 was routed, with 10,000 killed or wounded and 15,000 captured. Nevertheless, it was a fierce battle, with 5,000 French losses, and Napoleon mistakenly believed that he had faced the main body of the Prussian army. Further north at Auerstedt, both Davout and Bernadotte received orders to come to Napoleon's aid. Davout attempted to comply via Eckartsberga; Bernadotte, via Dornburg. Davout's route south, however, was blocked by the Prussian main force of 60,500 men, including the Prussian King, the Duke of Brunswick and Field Marshals von Möllendorf and von Kalckreuth. A savage battle ensued. Although outnumbered two to one, Davout's superbly trained and disciplined III Corps endured repeated attacks before eventually taking the offensive and putting the Prussians to flight. Though in sight of the battle, Bernadotte took no steps to come to Davout's aid, for which he was later censured by Napoleon. The Prussian army was divided into three armies drawn from across Prussia. Prussia's main weakness in 1806 was its senior command structure, which included command positions being held by multiple officers. One such example is the position of Chief of Staff, held by three different officers: General Phull, Colonel Gerhard von Scharnhorst and Colonel Rudolf Massenbach. This confusing system led to delays and complexities that resulted in over a month's delay before the final order of battle was prepared. Another obstacle facing the Prussians was the creation of a unified plan of battle. Five main plans emerged for discussion; however, protracted planning and deliberating shifted the initiative to the French. Thus, the Prussian plans became mere reactions to Napoleon's movements. Although Prussia had begun its mobilization almost a month before France, Napoleon had kept a high state of readiness after the Russian refusal to accept defeat following the War of the Third Coalition. 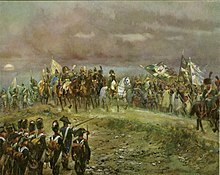 Napoleon conceived a plan to force Prussia into a decisive battle, like Austerlitz, and pre-empt the Prussian offensive. Napoleon had a major portion of his Grande Armée in position in present-day Baden-Württemberg in southwest Germany, and thus decided on a northeast advance into Saxony and on to Berlin. The battle commenced on the morning of 14 October 1806, on the grassy fields near Jena. The first movements of the French Army were attacks on either flank of the Prussian lines. This gave the supporting armies (making up the central attack) time to get into position. These skirmishes had little decisive success save for a breakthrough by the French General Saint-Hilaire who attacked and isolated the Prussian left flank. At this time, Marshal Michel Ney had completed his maneuvers and had taken up position as ordered by Napoleon. However, once in position Ney decided to attack the Prussian line despite having no orders to do so. This proved to be an almost disastrous move. Ney's initial assault was a success, but he found himself overextended and under heavy fire from Prussian artillery. Recognizing this distressed salient, the Prussian general ordered a counterattack and enveloped Ney's forces; Ney formed them into a square to protect all their flanks. Napoleon recognized the situation Ney was in and ordered Marshal Jean Lannes to shift from the center of attack to help Ney. This action would leave the French center weak. However, Napoleon deployed the Imperial Guard to hold the French center until Ney could be rescued. This adaptability was one of Napoleon's greatest strengths. He kept the Imperial Guard under his direct command, and could order them to take positions depending on the situation that the battle presented him. This rescue worked and Ney's units were able to retreat from the battle. Although the French were in a troubling situation at this moment, the Prussian commanders did not take the initiative to push at the French weaknesses. This would later be considered their undoing. The inactivity of the Prussian infantry left them open to artillery and light infantry fire. One Prussian general later wrote "the area around the entrance of the village was the scene of the most terrible blood-letting and slaughter". It was at this time around one p.m. that Napoleon decided to make the decisive move. He ordered his flanks to push hard and try to break through the Prussian flanks and encircle the main center army, while the French center would try to crush the Prussian center. 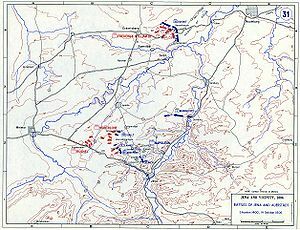 The attacks on the flanks proved to be a success and caused many of the Prussian divisions on the flanks to flee the battlefield. With its flanks broken, the Prussian army was forced to withdraw and Napoleon had won another battle. In total the Prussian army lost 10,000 men killed or wounded, had 15,000 prisoners of war taken as well as 150 guns. General Étienne Gudin's Division were on the move from Naumburg before 6:30 a.m. By 7 a.m. the 1st Chasseurs were stopped cold in their tracks outside of Poppel by Prussian cavalry and artillery. There was a heavy fog that had lifted just as they approached the village. Once Davout became aware of the Prussian force, he ordered Gudin to deploy his force at Hassenhausen. The Prussian commander on the field was Friedrich Wilhelm Carl von Schmettau. His division was actually under orders to proceed down the very road that Davout was on, to block his advance in the Kösen Pass. While Schmettau's troops were deploying to attack Hassenhausen, Blücher arrived with his cavalry and deployed on his left. Together they attacked Gudin's troops and pushed them back to the village. Prussian wounded and stragglers leaving the double battle by Richard Knötel. Wartensleben arrived at 8:30 a.m. with Brunswick, who ordered his infantry to the left flank and his cavalry to the right. The rest of the French cavalry arrived at 9 a.m. and was placed on Gudin's left. General Louis Friant's Division and the 12-pound artillery arrived at 9:30 a.m. and moved in squares on Gudin's right. The advance of the French squares forced Blücher's cavalry back. Seeing no other option available he ordered his cavalry to attack. At this very moment two of Wartensleben's regiments attacked Hassenhausen. Everything failed: three Prussian cavalry regiments were routed and the infantry fell back. At this critical point, Brunswick needed to take drastic action. Shortly before 10 a.m. he ordered a full assault on Hassenhausen. By 10 a.m., Brunswick was carried from the field mortally wounded along with Schmettau who was also badly wounded. With the loss of these two commanders the Prussian command broke down. The Prussian army was in danger of collapse. Oswald's infantry and the Prince of Orange, the later William I of the Netherlands, arrived about 10:30 a.m., and the King made his only decision of the day, to split Orange's command in two, half to each flank. On the French side, Morand's Division arrived and was sent to secure Gudin's left. Davout could now see that the Prussians were wavering, so at 11 a.m. he ordered his infantry to counter-attack. By noon Schmettau's center was broken and forced back over the Lissbach Stream, Blucher's cavalry was blown, and Wartensleben was trying to reposition his troops. The Prussians realized all was now lost and the King ordered a withdrawal. Davout's corps had lost 7,052 officers and men killed or wounded, while Prussian casualties were 13,000. Napoleon after the Battle of Jena. Napoleon initially did not believe that Davout's single Corps had defeated the Prussian main body unaided, and responded to the first report by saying "Your Marshal must be seeing double! ", a reference to Davout's poor eyesight. As matters became clearer, however, the Emperor was unstinting in his praise. Bernadotte was severely censured, and was nearly dismissed — despite being within earshot of Auerstedt and within marching distance of Jena, he ignored his orders and did not participate in either battle. Davout was made Duke of Auerstedt. Lannes, the hero of Jena, was not so honored. 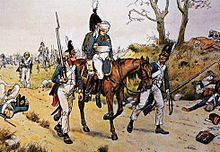 On the Prussian side, Brunswick was mortally wounded at Auerstedt, and over the next few days the remaining forces were unable to mount any serious resistance to Murat's ruthless cavalry pursuit. In the Capitulation of Erfurt on 16 October, a large body of Prussian troops became prisoners with hardly a shot being fired. Bernadotte crushed Eugene Frederick Henry, Duke of Württemberg's Prussian Reserve on the 17th in the Battle of Halle. Davout led his exhausted III Corps into Berlin on 25 October. Hohenlohe's force surrendered on 28 October after the Battle of Prenzlau, followed soon after by the Capitulation of Pasewalk. The French ran down and captured several small Prussian columns at Boldekow on 30 October, Anklam on 1 November, Wolgast on 3 November, and Wismar on 5 November. The corps of Blücher and Winning were destroyed at the Battle of Lübeck on 6 and 7 November. The Siege of Magdeburg ended on 11 November with Ney's capture of the fortress. Isolated Prussian resistance remained, but Napoleon's primary foe was now Russia, and the Battle of Eylau and the Battle of Friedland awaited. Thus Napoleon at Jena had known nothing about the main action that took place on that day; had forgotten all about two of his corps; did not issue orders to a third, and possibly a fourth; was taken by surprise by the action of a fifth; and, to cap it all, had one of his principal subordinates display the kind of disobedience that would have brought a lesser mortal before a firing squad. Despite all these faults in command, Napoleon won what was probably the great single triumph in his career. The Pont d'Iéna in Paris was built to commemorate the Battle of Jena. The battle proved most influential in demonstrating the need for reforms in what was then still a very much feudal Prussian state and army. Important Prussian reformers like Scharnhorst, Gneisenau and Clausewitz served at the battle. Their reforms, together with civilian reforms instituted over the following years, began Prussia's transformation into a modern state, which took the forefront in expelling France from Germany and eventually assumed a leading role on the continent. The German philosopher Hegel, who was then a professor at the University of Jena, is said to have completed his chef d'œuvre, the Phenomenology of Spirit, while the battle raged. Hegel considered this battle to be "the end of the history", in terms of evolution of human societies towards what we would call the "universal homogeneous state"
Napoleon built a bridge in Paris which he named after this battle. When he was defeated, the Prussian contingent of the allied forces of occupation was so incensed by its name that they wished to destroy the bridge. Talleyrand (temporarily) renamed the bridge after the French Grand Army, which dissuaded them from doing so. The station of the Paris Metro at the bridge has the same name. ^ Chandler 1966, p. 479–506. ^ a b c d e Chandler 1966, p. 1119. ^ van Creveld, Martin (1985). Command in War. Cambridge: Harvard University Press. p. 96. ISBN 0-674-14440-6. ^ The argument is discussed in depth in Francis Fukuyama's book The End of History and the Last Man. Chandler, D. (1966). The Campaigns of Napoleon. New York City: Scribner. ISBN 978-0-02523-660-8. Heyman, Neil M. "France against Prussia: The Jena Campaign of 1806." Military Affairs (1966): 186-198. Petre, F. Lorraine Napoleon's Conquest of Prussia 1806 (1907. 1972 edition, Arms & Armour Press). Wikimedia Commons has media related to Battle of Jena-Auerstedt. "Auerstädt" . New International Encyclopedia. 1905. "Auerstadt" . Encyclopedia Americana. 1920.